The Giant Ramshorn Snail (Marisa cornuarietis) also known to tropical fish keeping enthusiasts as the Columbian Ramshorn Snail, is a relatively large species in the family Ampullaridae that is native to northern South America and Central America. In addition to being native to Brazil, Bolivia, Colombia, Costa Rica, French Guiana, Guyana, Panama, Suriname, Trinidad and Tobago, Venezuela; the Giant Ranshorn Snail has spread to Cuba, Florida, Texas, California, and even Idaho. Here in Florida, established populations occur in Broward, Dade, Monroe, and Palm Beach counties where they were introduced to control Water Hyacinth and Hydrilla. The Giant Ramshorn Snail (Marisa cornuarietis) is actually an aquatic gastropod mollusk member of the Apple Snail family; Ampullariidae. They are NOT closely related to true ramshorn snails which are in the family Planorbidae. Marisa cornuarietis stay close to the surface of the water and prefer shallow waters with a lot of vegetation. Although they are known to tolerate relatively high concentrations of salt and are occasionally found in lightly brackish waters, they are unable to reproduce in these conditions. Giant Ramshorn Snails are a large freshwater species that have gills, lungs, and an operculum. Their lungs allow them to survive in waters with low levels of dissolved oxygen where many other species would perish. Their beautiful shells and scavenging abilities make them popular with tropical fish keeping enthusiasts, and they are also used in the wild as a weed and biological control agent. Because of the planispiral coiling, the shells of Giant Ramshorn Snails closely resemble the shells of the Great Ramshorn Snail. Their shells are flat coiled, often unequally striped, and vary from a dark yellow to brownish yellow, pale to dark red, red brown, to more vivid shades of both colors. The 3 to 6 dark spiral bands (not present on the spine of the shell) mainly located at the umbilicus, can be a dark brown or even black color. Yellow and black mutations without a banding pattern are also relatively common. The visible soft parts of the body can be colored white with a yellowish, gray and black pattern with pigmented spots however, the snail’s upper side is often just beige with the bottom a darker brown color. They have a breathing tube that is shorter than most Ampullaria, and the edge of their round operculum is normally visible from under the shell. Their shells are much larger than true Ramshorn Snails and can exceed 2″ in diameter. Giant Ramshorn Snails prefer slow moving water with large amounts of aquatic vegetation and are found in lakes, ponds, irrigation systems, ditches, and swamps. They are omnivores that feed on decaying vegetation, animal and vegetal detritus, dead fish, and the roots of floating plants (particularly Water Hyacinths and Hydrilla). They consume huge amounts of plant matter and unless only one or two specimens are housed in a tank, they are not ideally suited for aquariums where plant growth is being encouraged. 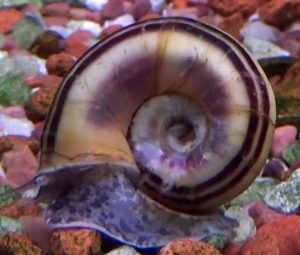 Giant Ramshorn Snails are not hermaphroditic and unlike most Apple Snails will lay their eggs in disk shaped clutches below the water line on almost any substrate, usually the aquarium glass. When first deposited, the eggs are about 2 to 3 mm and are visible as small whit dots inside a transparent gelatinous mass. 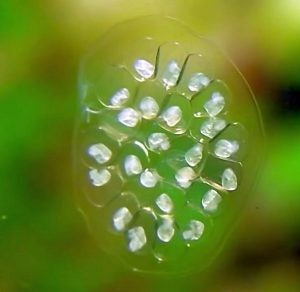 As the snails develop to 4mm, they become more transparent and look like little spots attached to the outside of each egg. Hatching depends on temperature and usually occurs within two weeks. The young snails will lose themselves in the gravel and take care of themselves without any additional assistance. 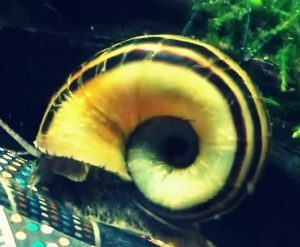 Giant Ramshorn Snails are usually available from tropical fish keeping shops on request or online at reasonable prices when they are 3/4″ to 1 1/4″ in size.